The internet of things (IoT) is a notion that best describes the idea of everyday objects being connected to the internet and being able to identify themselves to other devices. These devices could be anything; from a sensor or an actuator in the same machine, or in another machine and also could involve a human being. The internet of Things is a remarkable concept. Remarkable, because any object can show itself in a different way digitally making it more than just an “object”. The object no more associates itself to just its user, but now is connected to its surrounding and acts based on the surrounding it is placed in. The “things” in IoT represents an assortment of hardware, software and data. We can have any number of objects connect to the internet and have them interact with other devices or persons allowing for some kind of exchange of data. So, how does all this work? To put it in simple terms, IoT works on the concept that any device connects to the internet which facilitates the communication with another device for a particular use. IoT can be used for a number of applications. One of the many important uses of IoT would be predictive methods. IoT can be used to identify a problem with a system even before the problem occurs. A system in the field can be remotely monitored and examined by a person who identify a potential issue that may occur and take corrective action by either fixing remotely or visiting the site to replace components. IoT can be used to sense and control remotely using already existing infrastructure. This allows direct incorporation of existing devices into systems, resulting in much better accuracy and efficiency with minimal human interaction. integration of IoT with industrial robots is called The Internet of Robotic Things (IoRT). It is estimated that the IoRT market will be worth over $20 billion by 2022. Integration of IoT with industrial robots will help users worldwide in continuously measuring the performance of the robot with respect to each cycle, and continuously monitoring he components. A smart system/device can also be used to monitor the status of the robot and report as needed. With IoT, the robot by itself may be intelligent; it can collect all data and certain values from each of its sensors and either store or transmit live data that is acquired. 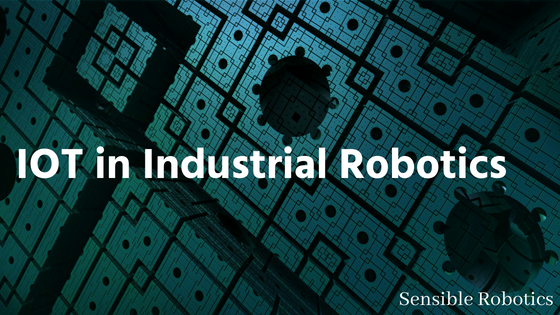 Apart from industrial robots, IoT can be used in robots that require remote sensing and detection. Device monitoring involves the monitoring the robot. Here, we collect relevant data from different part of the Robot to monitor the performance and status of the system. This data pumped to the cloud inturn as be accessed remotely by a stateholder to gather information for any use. Device management is another area where we can remotely upgrade software or upload code from the cloud, access the SD card/cards present on the robot. The main use would be to correct cycles when the robot does not perform its expected cycle. Lastly, User data management, which allows the user to easily access and analyze the data that is given by the robot. IoT brings with it a large number of possibilities in Industrial Robotics which will enable robots of tomorrow to integrate seamlessly on the shop floor and increase collaboration opportunities significantly. At Systemantics, we are constantly developing state of the art industrial robots embedded with the latest technologies to cater to the modern day shopfloor. Our flagship products the ASYSTR 400 & ASYSTR 600 is primarily built to enable widespread automation.